Removed the now defunct AltaVista and AllTheWeb from the list of available search engines. Added Yahoo! Site Explorer support. Site Explorer replaces AllTheWeb for use in determining what pages have links to a particular site. Added a new e-mail template variable, %MYPRIMARYTITLE%, which is replaced with the actual title of your site as entered under Site Settings. In contrast, the variable %MYTITLE% is replaced with the title of your site that is associated with whatever Site Profile is linked to the site that the e-mail is sent to. If you have added any Alternate Site Profiles under SEO Settings, %MYTITLE% will use the site title from one of those Alternate Site Profiles. Otherwise, it will use the Site Title entered under Site Settings. Added the Delay Between Service Queries setting, under Automation Settings. This specifies the pause (in milliseconds) between queries to third party services (such as Google PageRank checks). Longer pauses increase the wait time for some operations but decrease the chance that your site will be "flagged" as sending automated queries, and banned from making any further queries of that service. Removed support for the MSN search engine. MSN Search has been replaced by Bing, which does not support automated querying and so cannot be used by LinkMachine. Under "Link Approval Settings", you may now set the "Maximum Number of External Links on Reciprocal Link Page". If a site links back to your site from a page that has links to more than this number of different sites, the reciprocal link will fail the link quality criteria. A link submitted through LinkMachine's submission form may now be automatically rejected if the target page (the page you would be linking to, usually the site's home page) has a PageRank below a value that you specify. You can use this option by selecting a minimum PageRank value under Required Minimum PageRank For Site on the Link Approval Settings page. LinkMachine can now automatically check that the quality of a reciprocal link back to your site continues to meet your requirements. Whenever LinkMachine checks reciprocal links, it will verify that each reciprocal link's location and PageRank requirements (which you have specified under Link Approval Settings) continue to be met. If these quality requirements are no longer met, LinkMachine can send automatic notice e-mails to the webmaster of that site, and after several checks can also remove the link from your link directory. To have LinkMachine automatically send e-mail notices if a reciprocal link is found to fail your quality criteria, go to Change Settings, Automation Settings and check the box labelled E-mail Webmaster When Reciprocal Link Fails Quality Criteria. You can choose how many times the link must be found to fail quality criteria before the first notice is sent, under Number of Times Failed Before First Quality Criteria Notice Is Sent. A notice will then be sent each time the reciprocal links are checked, until the link once again meets your quality criteria, or until the link is removed. You can have LinkMachine remove the link automatically after it fails criteria several times, by checking the box labelled Remove Site When Reciprocal Link Fails Quality Criteria. The number of times that the link must fail criteria before it is automatically removed can be chosen under Number of Times Failing Quality Criteria Before Site Is Removed. A link may suddenly start failing your link quality criteria either by accident, or due to a shady webmaster using 'bait and switch' tactics to cheat his link partners by, for example, removing the link from his home page to his link directory after establishing link exchanges. Entries for InstantLink invitations received from or sent to other LinkMachine installations will now be automatically removed from the Site List if the other LinkMachine installation can no longer be contacted. LinkMachine now checks for the rel="nofollow" tag in the link from a site's home page to its link page. That link will not be counted as valid if it is marked nofollow. LinkMachine now performs frequent checks to make sure that there is a valid link from a site's home page to its link directory page, and disables LinkMachine's InstantLinks features for that site if no valid link is found. If the link from the home page to the link directory is found to be missing, LinkMachine will automatically send an e-mail to the contact address of that site's LinkMachine installation, daily, until the link has been restored. This can be turned off under E-mail Settings, by unchecking the box labelled Notify me if link from home page to link directory is missing. When exporting link data to a .csv format file, two new columns have been added, "PageRank" and "Reciprocal PageRank". LinkMachine's automation script, auto.php, is incompatible with some server cron job configurations. There is now a second automation script, auto_cron.php, that is compatible with many more server configurations. If you are having trouble getting a cron job to execute auto.php successfully, try changing it to execute auto_cron.php instead. These alternatives are explained on the Automation Settings page. Under "Add Sites to the List", the features "Add the links on a web page" and "Add the links from an html file" now have the additional option "Only add sites with contact e-mail". Fixed a problem that could cause a reminder e-mail to be sent out prematurely after a site's status was manually changed to "Exchange request sent". Now, LinkMachine will instead wait the number of days specified on the Automation Settings page. There is now the option to change the password associated with a LinkMachine account. This can be done under "Change Settings", "Account Settings". The Site Manager now displays all LinkMachine installations associated with the account, even those that are currently inaccessible. Inaccessible installations are marked "invalid". In the Site Manager there is now the option to remove any installation associated with the LinkMachine account. This is useful if an installation has been deleted; removing it from the account will free up the site license so that it may be used with a new installation. LinkMachine keeps a new backup data file, "linkmachine_max.dat", which represents the largest previous version of the data file. The site license used by a LinkMachine installation is now freed up automatically when that installation has gone unused for 14 days (instead of the previous 60 days). Updated to be able to access Google PageRank and Alexa Rank data once again (access requirements had been changed, which temporarily prevented LinkMachine from accessing PageRank and Alexa rank information). Quotation marks in link data are now handled correctly when output to .csv format files. The Maximum Length of Submitted Site Description value, under Link Approval Settings now applies to all link submissions, including InstantLinks. It previously applied only to links submitted through the link submission form. Under Add Sites To The List there is now a new option, Import the links from another LinkMachine installation. This can be used to import all of the links from another site that uses LinkMachine, running under the same LinkMachine account. For webmasters who manage the links for multiple related sites, this makes it possible to find new links with one LinkMachine installation and then simply import them into the other installations. Note that InstantLinks can only be imported if there is a link from the home page to the links page on the site you are importing them into. One way links are imported as is, and all other links are imported with the status E-mail not yet sent. When using the Rank Tracker to track a search rank, you can now enter your site's domain as the URL to track (for example http://mysite.com/) and Rank Tracker will return the rank of the highest ranked page on your domain that comes up for the given search. Previously, doing this would return the rank only of your site's index page. This also applies to subdirectories on your site; using the URL http://mysite.com/products/ will display the rank of the highest ranked page on your site that is within that subdirectory. As before, if you enter the URL of a specific page on your site, Rank Tracker will return the rank for just that page. Clarified an error message that is given when attempting to exchange InstantLinks with another site that has a LinkMachine installation with permissions problems that prevent the link exchange from succeeding. Added the option Maximum Length of Submitted Site Description under Link Approval Settings. The default maximum length of 200 for a submitted site's description can now be changed. Fixed problems that sometimes caused the content filter to allow submissions that match words in the filter. Link tags are now disallowed in the Site Description field, as they were being used occassionally to gain reciprocal links to multiple sites from a single InstantLink exchange. Fixed a problem with line break characters in the default Link Approval e-mail template. Fixed a problem that was causing some link pages with subcategories to be spaced differently when viewed with Internet Explorer versus FireFox. Fixed a problem that was preventing the Captcha security image feature from working correctly on some web servers. The content filter under Link Approval Settings now applies to InstantLink submissions as well as sites submitted through your link submission form. This can be used to prevent "spamming" of InstantLink submissions by sites dealing with unwanted topics. Added the option Use Absolute URLs under Link Page Format, Advanced Options. This causes all links between your link pages to use absolute URLs rather than relative URLs, and is useful for example if your page template uses the HTML base tag to specify a base URL for all relative URLs on the page. Fixed a problem that would prevent LinkMachine from working with SMTP servers that require authentication (username/password login). Added a new option to change which LinkMachine account is associated with a LinkMachine installation. This can be accessed under Change Settings, Account Settings. When a link page format is chosen that generates a separate page for each subcategory, the Category Link Page Filename and Category Link Page Template may now be chosen individually for each subcategory on the Link Categories settings page. Fixed a problem that would cause some sites' list of categories to appear blank when the site was listed as a potential InstantLink exchange. This was causing it to be impossible to exchange InstantLinks with those sites. The option to process upgrade payments using StormPay has been replaced with a different payment processor, MoneyBookers. When an attempt to accept an InstantLink invitation fails, a more specific error message is now provided. When choosing InstantLinks to add, the checkbox for a link is now automatically checked when a category is selected for that link. Subcategory link pages now use the page template specified for their base category, if one has been provided. The Site List's Show: Search mode now also checks for the search text in each site's Reciprocal Link URL. When importing and exporting link data in .csv format, a new field called Weight has been added to specify the Link Weight. Fixed a bug in the .csv file import feature that had prevented the Alternate Link Text value from being imported correctly. There is now the option to have LinkMachine create a separate link page for each subcategory of links, as well as for each category. To turn this on, go to Link Page Format settings, Advanced Options, and set Link Page Division to Separate page for each subcategory. Alternately, you can select one of the "Multi-page" Layout Styles. For a multi-page link directory, you can now have LinkMachine list numbered links to each of a category's pages after the name of that category in the category list. The advantage to this is that every one of your link pages will be linked to directly from your main link page, making them all equally accessible to visitors and search engines. To turn this on, go to Link Page Format settings, Advanced Options, and set Display Category Information to Numbered list of links to pages. You can now have LinkMachine place a horizontal line below the name of each category in the list of links. To turn this on, go to Link Page Format settings, Advanced Options, and check the box beside Underline Category Names. Some of the default Layout Styles have been changed to incorporate the new link directory layout features listed above. The link category named "Other" is no longer required and can now be renamed or removed. The only case now in which a link category cannot be removed is if it is your only link category; you must always have at least one link category. When a category or subcategory is removed, any links belonging to that category are now assigned to a different category automatically. When adding sites by keyword search or adding sites that link to a particular page, you can now select a category to which LinkMachine will assign the new links that are added. When adding new sites automatically, LinkMachine's check to avoid adding duplicates will now not only reject a site if another site with its exact URL is already in your link database, it will now also reject a site if any site with the same domain name is already in your database. This does a much better job of preventing duplicate site additions. Fixed a problem that caused link submission notification e-mails to be formatted incorrectly if Format e-mails for HTML was turned off. When selecting potential InstantLink exchange partners, LinkMachine now checks to make sure that categories have been selected for each InstantLink exchange chosen. This prevents users from forgetting to choose categories, and ending up with links under incorrect categories. To prevent automated submission of links by computer 'bot' scripts, LinkMachine Premium users can now add a CAPTCHA graphic to the link submission form. To submit a link, the letters shown in the graphic must be entered into the form. To turn on this feature, check the checkbox beside "Include CAPTCHA Image in Link Submission Form" on the "Link Approval Settings" page. Fixed a problem that caused some sites to be unable to accept InstantLink invitations. If your site has stopped receiving InstantLink invitations over the last few days, go to the "Site Settings" page and click "Submit" at the bottom of the page. This will fix the problem and allow your site to resume receiving InstantLink invitations. This update is major revision to the InstantLinks system. You can now search for sites to exchange InstantLinks with by entering search text. All available sites that include that text within their title, description or URL will be returned. This is in addition to the original method of searching for new InstantLink partners by selecting a category. The pages of search results listing sites that are available to exchange InstantLinks now appear much faster than they did previously. Only sites that have a link on their home page to their link directory page appear in the InstantLink search results. This ensures that when you exchange InstantLinks with a site, the link to your site will be findable by the other site's visitors and by search engines. In order to be able to search for sites to exchange InstantLinks with, your site's home page must have a link to your site's link directory page. This ensures that visitors and search engines can find your link directory. When searching for InstantLink partners, the search result pages display the total number of results found as well as the range of results currently being viewed. All duplicate site listings and inaccessible sites have been removed from the InstantLink database. Because Alexa now charges a small fee each time an application retrieves rank data, the option to display Alexa rank information is now turned off by default in LinkMachine. This option can be turned on via the Interface Settings page. By turning this option off by default, LinkMachine will be able to continue providing Alexa rank data for free to those users who wish to access it. Fixed a problem that had prevented LinkMachine from fetching Alexa rank data, due to a change in Alexa's system. On the SEO Settings page, there is now the option for each Alternate Site Profile to select whether that profile will be used for e-mails (link exchange invitations), InstantLinks, your site's link submission form, or any combination of these. This allows you to specify (if you wish) particular alternate profiles to be used for each of those three purposes. For instance, you may want to offer reciprocal links to visitors who submit their link, while using InstantLinks to create 3-way non-reciprocal links. Fixed a bug that, on a small minority of web servers, would cause the wrong "edit link" to be sent out in the e-mail to a webmaster who submits a site. Fixed another bug that would only occur on a small minority of web servers, and would prevent LinkMachine from determining the PageRank value of any pages. Added a new option under E-mail Settings, Format e-mails for HTML. By default this option is turned on. When on, HTML e-mails sent out by LinkMachine will automatically have HTML formatting added. Line breaks will be converted into HTML line break tags, and URLs will be turned into clickable links. If you would like to add your own HTML formatting to your e-mails, turn this option off so that the automatic formatting will not interfere with your own HTML tags. Note that you will then need to add your own line break tags, and your own anchor tags to make links clickable. When adding links from a .csv file, there is a new option, Update Existing Sites From File. This allows you to choose whether to update the data from the .csv file for sites that are already in your link directory, or to ignore any links in the .csv file that are already in your link directory. Added a new option to Automation Settings called Delay Between Automated Tasks. By setting this to a number of milliseconds greater than zero, you can cause LinkMachine to pause that amount of time after performing each automation task. This is useful if your web host restricts the CPU usage of scripts on your server, or the number of e-mails per minute that can be sent. On the E-mail Settings page, added the option Send notice when a link exchange invitation is accepted. On a site's Modify page, beside the heading Contact E-mail, there is a new link, Send Mail. Click this to open a blank e-mail in your mail client, with the site's contact e-mail address in the To field. When LinkMachine adds a site to the list and does not find a title on that page, it will use the site's domain name as a substitute for the title, rather than just leaving the title blank. When LinkMachine adds a site to the list and finds the site's e-mail address, it will replace " at " with "@" in the address. Added the option to remove entries from the Link Analyzer's list of existing projects. Fixed a bug that would somtimes cause submitted links to be listed after other links in the link directory, rather than in alphabetical order. Under Change Settings >> E-mail Settings, added the option to specify what SMTP server LinkMachine should use to send out e-mails. This allows you to use an SMTP server other than the one running on your site's web server. Under Change Settings >> Link Categories, a specific alternate profile can now be chosen for a category. All links in that category will be assigned the category's alternate profile. Any link in a category that has not been assigned a specific alternate profile will have its alternate profile chosen at random as usual. Fixed a problem that would sometimes result in a link being assigned a different random alternate profile when a new alternate profile was added or an old one was deleted. Now a link will keep the alternate profile that it is first assigned, so that all e-mails sent out regarding that link will contain the same site profile information. Added the option under Link Page Format settings to select a Search Results Page Template, the template to be used for search results. The "submit" buttons used on the link submission form and the search form now have a class assigned to them, so that their appearance can be changed using a stylesheet. Link exchange request e-mails can now be sent in bulk, as well as individually. To send a link exchange request e-mail to each site with the status E-mail not yet sent, click on Send All Link Exchange Requests in the Control Panel. There is now the option, when sending link exchange request e-mails in bulk, to also send out the e-mails to each site with the status No e-mail address. LinkMachine would guess at the e-mail addresses for these sites, by using standard guesses such as "webmaster@(domain)" that can be specified under E-mail Settings. Under Automation Settings, you may now have LinkMachine send out regular reminders to sites that have been sent link exchange request e-mails. You may specify the number of reminders to be sent, and the number of days between individual reminders. You may also have LinkMachine remove a site from your site list automatically if it has not responded to the link exchange request and reminders. Added the ability under Change Settings >> Backup Data to export LinkMachine's list of categories and subcategories to a .csv file, and likewise to import categories and subcategories from a .csv file. This makes it easier to copy a list of categories from one LinkMachine installation to another. It also makes it easier to add many categories at one time, by editing the .csv file in a text editor or spreadsheet program. You can now find out the date and time when LinkMachine last sent out an e-mail to a particular site. This information is on the site's Modify page, under Contact E-mail. LinkMachine Premium's reciprocal link check feature can now find reciprocal links that are on pages within frames. Because this depends on spidering the site, it is more likely to succeed the higher that Maximum Number of Pages to Spider for Link Check is set. Added a new option for purchasing additional site licenses. Besides the existing $10/1 and $200/50 options, there is now a $50/8 alternative. On the Automation Settings page there is a new section called Automation History that shows a log of all actions taken by LinkMachine's automation system over the past 30 days. The URL to be called (from a web page or using a server's cron job) to enable LinkMachine's automation system has been changed from linkmachine.php?ua=auto to auto.php. The old URL will continue to work. This change simplifies the system and makes it compatible with cron job limitations on some servers. Added new template customization options. As usual, the word #CONTENT# in a link page template will be replaced by LinkMachine with the full contents of the link page. But now, in addition, the following words can be used in a page template to insert just these elements of the page's content: #CTG_LIST#, #FEATURED_LIST#, #SEARCH_BOX#, #LINKS#, #STYLES#, #ALIGNMENT_OPEN#, #ALIGNMENT_CLOSE#, #PAGE_NUMBERS#, #NAV_LINKS#, #AUTOMATION_TAG#, #INSIGNIA#, #CTG_NAME#, #CTG_DESC#. This can be useful if you'd like to give your link pages a customized layout, or automatically insert each page's category name or description into the generated page's title or meta tags. Added the ability to LinkMachine Premium to spider a site in search of a missing reciprocal link. The number of pages that LinkMachine will spider in search of the link can be set on the Automation Settings page, under Maximum Number of Pages to Spider for Link Check. To turn off spidering altogether, set this number to 0. To turn on spidering on existing LinkMachine installations, set this to a number above 0. New installations have this set to 100 by default. On a site's Modify page, there is now the option to check the individual site's reciprocal link. To do this, click Check Link beside the Reciprocal Link URL. LinkMachine will check for the reiprocal link (and spider the site in search of the link, if applicable), then report whether the link has been found. A recent change made by Google to the format of their search results prevented LinkMachine from performing Google searches. LinkMachine has now been updated to accomodate this change. Fixed a problem that caused some edit URLs not to work correctly. Added the ability to set a link's weight. Links with higher weights appear higher on the link page, links with lower weights appear lower. Links with the same weight are ordered relative to one another according to your chosen Link Order (alphabetical or by date). The link given to webmasters to edit their own site's information now uses an encoded site identifier to provide better security. Information about purchasing additional site licenses has been added to the upgrade page for LinkMachine accounts that have not yet been upgraded to the Premium and/or SEO packages. Fixed a problem that prevented the SEO Wizard and Link Analyzer from working correctly on some new LinkMachine installations. LinkMachine can now automatically send an e-mail notice to the webmaster of a submitted site should you choose to reject that link submission. To have LinkMachine send a rejection notice when a site with the status "Not yet reviewed" is removed, go to the E-mail Settings page and turn on Send notice when a link is rejected. You can modify the template for this e-mail; it is the Link Rejection Notice E-mail template at the bottom of the E-mail Templates settings page. On a site's 'Modify' page, the URL of the page in your link directory where that site's posted is now displayed, under "Site Listing Link". Minor improvements to navigation link code and .csv file import. Added a new upgrade package featuring a complete suite of SEO tools: SEO Wizard compares your site's on-page and off-page factors with those of your most successful competitors to provide a detailed step-by-step guide for improving your site's search ranking. Link Analyzer compiles detailed information about all incoming links to your site and your competitors' sites, uncovering the methods used by the most successful sites to gain top ranks. Rank Tracker graphs the progress of your site's ranks, including search rankings, PageRank, Alexa rank, number of incoming links, and more. For more information about these new SEO tools, see this page. Added a navigation menu in the upper right corner of the LinkMachine interface, as a shortcut to various pages. The message that appears when a reciprocal link check completes was not including InstantLinks in its count of link exchanges. This has been fixed. Admins can once again submit a site manually even if that site is not accessible by LinkMachine. Visitors remain unable to submit inaccessible links. Clicking on the name of a subcategory in a link directory's list of categories will now lead to the correct page containing the links for that subcategory, even if there are several pages of links in the category. The URL that is generated for the %LINKURL% wildcard in e-mail templates is now correct even if the link is not on the first page of links for its category. The problem with the %EXCHANGEURL% wildcard used in e-mail templates has been fixed. Under Site Settings there is a new option, "Filename of Link Submission Form". The ability to change the filename of the submission form is especially useful if your page template includes Php or shtml code, which will only work correctly on a page that has a filename ending with the appropriate extension. If Navigational Links is turned on, the "Home" and "Back" links will now also be added to the link submission page. It is now possible to have LinkMachine add categories to your link directory even if they do not contain any links. To do this, check the checkbox labelled "Include Empty Categories" on the Link Page Format settings page. This is especially useful for multi-page directories, so that each category's page can exist (and be spidered by search engines) even before the catgeory includes any links. On the link submission page and the admin modify site page, a link's category is now selected using a pop-down menu rather than a scrolling list of categories. The Site Manager now lists, for each site, its number of completed link exchanges. It's now possible to change the category or status of multiple sites at once. Check the checkbox for each site in the list that you want to change the category or status. (Check the topmost checkbox in the title line if you want to check all of them). Then select the category or status you would like from the menu for any one of the checked sites. You will be asked whether you would like the change to apply to all of the checked sites. Alternate profiles work a bit differently now. If you have entered any alternate profiles at all, then the information given about your site to webmasters who submit a link will be taken from one of your alternate profiles (chosen randomly). The information under Site Settings will not be used at all if you have any alternate profiles. This allows you to choose not to use the information under Site Settings in any of your link exchanges. If you do want to use that information in some link exchanges, enter it as one of your alternate profiles. Any sites that already have one or more alternate profiles have had their Site Settings site information added automatically as a new alternate profile, so that the information LinkMachine gives out about your site will remain unchanged. Alternate profiles are now also used to fill in the %MYTITLE%, %MYDESCRIPTION%, %MYURL%, and %MYDOMAIN% wildcards in e-mail templates. Under Text Settings you can now alter the text of the "Submit" button at the bottom of the site submission page. Under Interface Settings you may now choose how many sites per page will be displayed in the site list on your admin home page. The interface for exchanging InstantLinks has been improved. Added several Element Templates under the advanced link page format settings. These templates allow expert users to modify the actual Php code used to generate the various elements of the link directory. While most customization can be done using the standard link page format settings, LinkMachine users who are familiar with Php and HTML may choose to further customize their link directory pages by modifying these Element Templates. Introduces Automation into LinkMachine Premium. LinkMachine can now check all reciprocal links on a regular basis, automatically e-mail notices to the webmasters of sites where it finds a reciprocal link missing, and remove a site from your link directory when its reciprocal link has been found missing often enough. To learn about activating automation and the various automation options, go to Change Settings > Automation Settings. LinkMachine now has several new options for automatically approving or rejecting newly submitted links. These include the options to reject a new link based on the PageRank and/or location of its reciprocal link, the content of the site, and more. To access these settings go to Change Settings > Link Approval Settings. For sites hosted on servers that do not support Php's allow_url_fopen feature, there is now the option on the Site Settings page to use Php's Curl library instead. This option is set appropriately by LinkMachine upon installation. Additional text settings have been added under Change Settings > Text Settings. These include all of the possible messages that can result from submitting a new site through the site submission form, and the messages that appear when visitors perform a search of the link directory. The message that is shown when a reciprocal link check is completed is now clearer. There is now the option to exclude any category from the list of categories made available when a visitor submits a new link. This allows you to reserve some categories that only you (as the admin) can add sites into. It also allows you to make unavailable the category Other, which LinkMachine uses as a default and does not allow to be deleted. To exclude a category, go to Change Settings > Link Categories and check the checkbox labelled Exclude Selected Category from Submission Form. Added several new e-mail template wildcards: %RECURL%, %MYEMAIL%, %MYDOMAIN%, and %MINPR%. Fixed a problem that prevented category names that include quotation marks from working correctly. Fixed a recent problem that prevented LinkMachine from accessing Alexa Rank information. LinkMachine now works properly on web servers that have the unusual Php option 'magic_quotes_runtime' turned on. Added a new e-mail template, for sending a follow up reminder to sites that have not responded to an initial link exchange request e-mail. A site with the status Exchange request sent now has a Send reminder link on its entry. After sending a reminder, the site's status is changed to Exchange reminder sent. The maximum length of the text fields on the Text Settings page has been increased to 200. Added Yahoo! to the choice of search engines to use when finding potential link partners. Fixed a problem that would occassionally prevent link pages from being generated on older installations of LinkMachine. If Require Admin Approval Before Posting Submitted Links is turned off, then when a link is submitted (and automatically approved) an e-mail is sent to the submitter, letting them know their link has been approved. URLs that contain a single-quote character (') are now handled correctly. A site's Alternate Link Text (if provided) is now shown instead of its actual URL when the site appears in search results. You can now place one site under multiple categories in your link directory. You can enter a site (same URL) multiple times and place each one in a different category. Only the admin can do this; visitors submitting sites through the site submission page cannot submit a site if there is already a site with the same URL in the link directory. Added a link directory search feature to LinkMachine Premium. Under Link Page Format settings, the Search Box option allows you to place a search box at either the top or bottom of your link pages. This search box can be used by visitors to search your link directory for any text they enter. Under Link Page Format >> Advanced Options, there is a new setting, Submission Form Field Width, which allows you to change the width of the input fields on the link submission form. This is useful if the default width of the form fields is too wide for your link page template. The link category named "Other" can no longer be removed. Introduced the Site Manager tool, a new feature of LinkMachine Premium that gives quick information and access to each LinkMachine installation associated with your account. To go to the Site Manager, click on Site Manager near the bottom of the admin home page. On the "Link Categories" settings page, there is now the option to specify the filename for a category's link page. The filename specified would be used instead of the default filename for the category. This can be useful for giving multiple link pages specific filenames so that they will replace existing link pages with those names, that were not created by LinkMachine. Various minor interface improvements on the Link Categories settings page. When having LinkMachine search for new sites, there is now the option to choose which search engine will be used. Choices include AllTheWeb, AltaVista, Google, and MSN Search. If Require Reciprocal Link Before Accepting Submission is turned on, then LinkMachine will now make sure that the reciprocal link URL given in a site submission does not point to a page located on the same site where LinkMachine is installed. Added a master checkbox beside "Site Name" in the Site List header. This checkbox can be used to select or deselect all of the sites in the list. Fixed a problem that could cause slash characters to be added before quotation marks and apostrophes in the title or description of sites added using the site submission form. Fixed a problem that occured when having LinkMachine add new sites via a keyword search, which would sometimes result in too few sites being returned. When adding links from a .csv file, if a link belongs to a category that doesn't yet exist in LinkMachine's database, that category will now be added automatically. Improved support for importing links from .csv files generated by Arelis. Fixed a problem that would sometimes cause a formatting error on link pages with more than one column of links. Made available the LinkMachine User Guide e-book. 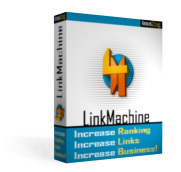 LinkMachine now determines a site's ranks immediately upon adding the site. In the Site List, the PageRank of a site's home page is now followed, after a slash, by the PageRank of its page with the reciprocal link to your site. Fixed a problem that was causing a site's reciprocal link anchor text to appear in the edit site form for that site. Added a new feature, Smart Template Linking, that makes it easier for web novices to create a custom page template. Smart Template Linking is turned on by default on new installations, and can be turned on or off under Link Page Format settings, Advanced Options. This feature will attempt to replace relative link paths in the page template files with absolute paths, so that the links work regardless of the location of the finished link page files. The word #CONTENT# in a page template file no longer needs to be capitalized in order to work correctly. Under Change Settings >> Upgrade LinkMachine, you can now view both the number of site licences you have purchased and the number that are currently in use. The entry fields used to change the standard text for the title of the featured sites list, and the title and descriptive text on the link submission form, have been moved from the Link Page Format settings page to the Text Settings page. Added a new feature, Alternate Site Profiles (available on the SEO Settings page). Your site's primary profile is the title, description, and URL that you enter under Site Settings. Normally when another site links to you, their reciprocal link to your site will use the information from your primary site profile. However, by adding alternate site profiles, you can encourage diversity in the reciprocal links back to your site. When another site links to your site, the link information they receive about your site is chosen randomly from either your primary site profile or any of your alternate site profiles. So for example, you can create several alternate profiles with different Site Titles, which will result in reciprocal links to your site that vary from one another in their anchor text. You could also create alternate site profiles with different URLs, so that reciprocal links will point to various pages on your site (or even various sites). When you have LinkMachine check all sites for reciprocal links, it will look for links to the URL in your primary site profile as well as the URLs in any of your alternate site profiles. Added a new option on the Link Page Format settings page, Require Admin Approval Before Posting Submitted Links. This option is turned on by default. If you turn it off, new links will be posted to your link directory as soon as they are submitted (and checked for a reciprocal link, if you have Require Reciprocal Link Before Accepting Submission turned on). Turning off this option allows for increased "hands-off" automation, but can result in unwanted links being added to your link directory. Added the new %NAME% e-mail template wildcard, which will be replaced with the contact name of the site being e-mailed. Fixed a problem that was causing the status of links not to be changed to Link exchange complete after a reciprocal link was entered by that site's webmaster in response to a link exchange invitation. Fixed a problem that would sometimes cause InstantLink exchanges to occur automatically (rather than only an invitation being sent) even though the two sites involved did not share any of their categories with one another. At the bottom of each site's Modify page, there are now several links to additional information about the site. This includes the site's Alexa information, its Internet Archive page, and its lists of backlinks according to either Google or MSN Search. The "Form Text Settings" page has been renamed to "Text Settings", and now has options to change the text for the standard "Home", "Back", and "Add Link" navigational links that LinkMachine places on the link pages. LinkMachine now automatically removes spaces from the URLs of submited sites. This will prevent occassional problems resulting in a reciprocal link not being found because a misplaced space rendered the link invalid. The .csv file import feature has been improved to better handle .csv files generated by Arelis. LinkMachine now shows the anchor text that each site uses in its reciprocal link back to your site. On a site's Modify page, the anchor text is displayed below the label "Reciprocal Link URL". You can now choose to list only those sites that have a reciprocal link back to your site that uses anchor text other than what you've entered under "Site Title". To do this, select "Sites with Irregular Anchor Text" from the "Show" menu. When adding a new site by hand or modifying a site's details, you can just enter the URL and then have LinkMachine attempt to fetch the site's title, description, and e-mail address. To do this, click on the Fetch Info link beside Site URL. LinkMachine will only fill in the title, description and e-mail if those lines are blank; it won't replace the values you've already typed in. A site's Alexa rank and (optionally) Google PageRank are now listed under Site URL on a site's details page. To have LinkMachine show the Google PageRank, go to Change Settings >> Interface Settings and select Show the Google PageRank of Each Site. Note that this is a form of automatic querying of Google's search engine, which may not be in compliance with Google's terms of service. You may now have LinkMachine require that a site's reciprocal link to your site is working before that site may be submitted for a link exchange. To require this, go to Change Settings >> Link Page Format and select Require Reciprocal Link Before Accepting Submission. Under Change Settings >> Backup Data, there is now the option to download your LinkMachine link data as a .csv file. This is a spreadsheet file that can be loaded into Excel. This is useful for backing up your link data, generating link reports, and transferring links from one LinkMachine installation to another. Under Add Sites To The List there is now the option to add links from a .csv file. This is useful for importing links from a different link management program, or from another installation of LinkMachine. When checking reciprocal links, LinkMachine now does not count links that include the new rel="nofollow" tag. Links that include this tag are not followed by search engines, and so are useless for SEO purposes. Fixed a bug that would cause the progress bar to display incorrectly during the process of checking for reciprocal links. Added the option to purchase LinkMachine Premium site licenses in blocks of 50, for $200. This is a cost effective option for webmasters who run many different web sites. LinkMachine now keeps several more backup copies of a site's link data, at one day intervals. Several users experienced an unusual problem that caused their %EDITURL% links to fail. This is because their web servers do not allow local files to be accessed via HTTP. Now, under Change Settings >> Site Settings there is the option to test whether your site supports HTTP local access, and have LinkMachine use an alternative method if it does not. Under Change Settings >> Link Categories there is now the option to choose from a comprehensive list of common link categories to add to your own link directory. This can save you time if you'd like to include a broad range of site categories in your link directory. Under Add Sites To The List >> Add sites by keywords there is a new pop-down menu allowing you to choose whether LinkMachine will search for sites that match the keywords you provide, or the sites that link to the sites that match those keywords. StormPay has been added as an alternative to PayPal for payment processing. This is especially useful for those who live in countries that are not supported by PayPal. Under Interface Settings, there is now the option to choose whether the entry for each site on the admin site list will display the title of the site, its URL, or both. Added the option to order the admin site list alphabetically by site URL. In the admin site list, beside the title of each site that has a reciprocal link back to your site is a chain-link icon. Click on this icon to view the page on that site contaning the reciprocal link back to your site. The admin site list Search option will now also show sites containing the given search term in their category title. Added a new Settings page, Form Text Settings, where you can change the text of the input field titles and descriptions on the form pages used by visitors to submit and modify sites. This is especially useful for sites aimed at speakers of a language other than English. Added a Log Out link at the bottom of the main Admin page. Fixed a problem that caused link pages for categories with names that included unusual characters such as ">" to become inaccessible. The default location and file name for a LinkMachine link page is now "resources/resources.html". This is because using the word "links" may make a link page less valuable in the eyes of some search engine spiders. There is a new option on the Modify Link page, allowing you to set alternate text for a link, that will appear instead of the link's URL when a visitor passes the mouse over that link. This is especially handy for affiliate links. The number of links in each category can now be displayed after the name of each category in the category list even when it is set to display as a directory. The "Add the links on a web page" feature now excludes links to other pages on the same domain as the page of links itself. Fixed a rare problem with the "Add the links on a web page" feature that caused it to skip some links. Improved the formatting of the "Thank You" page that a visitor sees when they submit a link to LinkMachine. The correct title font and table width are now used. On the same "Thank You" page, navigational links are now included if turned on under Link Page Format Settings. When this "Thank You" page is generated by the free version of LinkMachine, it now includes a link to the LinkMachine site. Anchor name tags on link pages now have closing tags. This fixes some unusual formatting problems involving style sheets that redefine the anchor tag. Under "Change Settings" > "Link Page Format" > "Link Order", expanded the "Date Added" option to "Date Added (newest first)" and "Date Added (oldest first)". The later option will order the links from oldest to newest. This way, the URL of the page where a particular link is located will not change as new links are added. Fixed a display problem that would occur when the keyword line was left blank when adding new sites by keyword. If the directory specified as the "Location of Link Pages" doesn't yet exist, LinkMachine now automatically creates it. Added an administrator memo field to the Modify Site page. Added the ability to change a site's status from the Modify Site page. New link page format setting, "Show List of Categories On All Link Pages", determines whether the table of link categories will be displayed on all link pages or just the main link page. Fixed a problem that would sometimes display an incorrect link page URL after a visitor submits a new link. The default link page navigational links now include an "Add Link" link, that takes visitors to the page where they can submit a new link. Fixed a problem that would cause a site's status to be switched to "Link exchange complete" when that site's info was edited using the %EDITURL% link. Added the ability to rename existing link categories and subcategories. All link page filenames are now based on the main link page filename that is entered under "Site Settings". This allows you to customize the filename and extension of all your link pages. There is a new option under "Link Page Format" settings, to set the maximum number of links to be displayed on a single link page. Links can now be split among multiple pages. This only applies to category link pages, not to the main link page. To avoid displaying old versions of admin pages due to data caching on some browsers, all admin URLs are now timestamped. When viewing and modifying a site's details, you now have the option to open the site's URL and reciprocal link URL in a new window. Fixed a problem that prevented subcategories from being added under the category "Other". LinkMachine now checks to make sure that the given main link page filename is formatted correctly. If the free trial of LinkMachine Premium expires and there are currently one or more live InstantLink exchanges, a notice appears alerting the user to upgrade to LinkMachine Premium in order to keep those links. Fixed a problem that caused spaces to sometimes be missing in non-HTML e-mails. Fixed a problem that had made it impossible to use category names containing apostrophes. Fixed an interface layout flaw on the Link Page Format page. Link pages generated with the standard free version of LinkMachine are now branded at the bottom "This Page Powered By LinkMachine". Link pages generated by LinkMachine Premium do not have this text. When adding the links from a web page or file, there is now the option to have LinkMachine seach each site that it adds for a contact e-mail address. Added a search feature to the site list. Select Search from the Show menu to enter search text. Added the ability to easily send additional reminders to link partners whose reciprocal link to your site is missing. Also added a new e-mail template for doing this, Link-Back Missing Reminder E-mail. Fixed a bug that caused LinkMachine not to find reciprocal links if the text case of the URL didn't match. Fixed a problem that made the cursor jump to the end of the site description text every time a letter was typed. Changed the category pop-down menu on the Add InstantLinks page to a scrollable list. Added "Site Categories" setting on the Site Settings page. Added the ability to easily exchange links with other LinkMachine users, via the new InstantLinks system. To search for other LinkExchange users' sites to exchange links with, choose "Add Sites To The List" and then "Exchange InstantLinks with other LinkMachine users". Added ability to delete multiple sites at once, if the sites already have the status "Removed", "Duplicate", or "Irrelevant". Split the long Settings page by subject into several smaller pages. Added an Interface Settings page. LinkMachine can now be set to update the site list immediately when a change is made to a menu selection. The new LinkMachine Helper provides context sensitive guidance about using LinkMachine. It can be turned on and off from the Interface Settings page. On the Link Categories page, you can now choose to specify a different HTML template to use for each category's link page. This way, you can tailor the title, meta tags, and content of each link page to fit its category. Now when LinkMachine's free trial period expires, it remains functional. Only its premium features (InstantLinks, site search by keyword, and site search by link) become disabled, until a LinkMachine Premium license is purchased. Fixed a problem that prevented accounts from being created with an e-mail address that had any periods before the '@'. Fixed a bug that prevented LinkMachine from using Google's Web API correctly. Searches now run faster and are less likely to time out. The links on the "Thank you" page, seen after a site is submitted, now correctly appear in the chosen color and style for link text. Fixed a problem with uploading backup data. Changed the way that e-mail is sent, to fix a few minor bugs. Fixed a problem that prevented an icon image from appearing if its URL was entered without the "http://". A new script, link_exchange.php, is now generated in the same directory as the link pages. Link submission is handled through this script now, rather than directly through linkmachine.php. This means that the image files used on your link page templates can now be in the same location as those used in your submission page template. Added several new page templates. Existing LinkMachine users can download the new templates as part of the LinkMachine install file, here. Added a "View Template" option beside the "Main Link Page Template" setting, to preview the chosen template. Added "Open Links In New Window" option. With this option checked, link page links will open in a new browser window rather than replacing your site in the same window. When performing a search for potential link partners, LinkMachine now re-sends a search request if no response is received after 45 seconds. This is to prevent "hang ups" that would sometimes halt searches. Changed the "E-mail Notification" section of the Settings page to "E-mail Settings", and lowered it to be near the "E-mail Templates" section. Moved the "Use This Site's Server To Send E-mails" setting to this section. Added an option to the "E-mail Settings", to have LinkMachine send all of its e-mails out as HTML rather than plain text. HTML e-mails appear more consistently between e-mail clients and include clickable links. Added a Link Page Format advanced setting, "Submission Result Page URL". When a visitor submits a site, they will be redirected to the URL you enter here. If this is left blank, they will be shown the standard LinkMachine "Thank You" page. Added a Link Page Format option, "List Potential Link Partners". By turning this on, a site is added to your link pages as soon as you sent its webmaster an e-mail requesting a link exchange. Many webmasters respond more favorably to a link exchage request if the link to their site has already been posted. Added a new link exchange request e-mail template, for when "List Potential Link Partners" is set to true. Added a new site status, "One way link", for sites that you want listed on your link page but that you don't require to link back to your site. Sample bullet points now have transparent backgrounds. Fixed a bug in the reporting of the number of links found when checking for reciprocal links. Options to delete sites from the site list have been replaced with options to change their status to "Removed". This way, the sites will not be re-added by new searches. Added this version history log. Changed the format of the site submit/modify pages to match similar pages, and to include descriptions of the various settings. Fixed a problem that would cause a site's status to be reset to "E-mail Not Yet Sent" when the site's information was modified. Added the ability to display a link icon image beside a link. Useful for marking a link as being special. Added pages of sample bullet and icon images. Added the Site Contact Name site setting. Added the %LINKURL% e-mail template wildcard, to insert the URL of your link page containing the link to the recipient's site. Added the %MYNAME% e-mail template wildcard, to insert your own name into the e-mails that LinkMachine sends out. Added two new e-mail notification options, one to send a thank you e-mail to a webmaster who has submitted a site, the other to send a confirmation e-mail to a webmaster whose site has been approved. Added a number of new link page format options including layout styles, alignment, bullets, indentation, directory style category lists, font size specified in pixels, additional HTML tag settings, and more. Simplified settings page by hiding most of the link page format options under "Advanced Options", and introducing several pre-defined link page layout styles. Link page colors can now be chosen using a graphical color picker. Fixed a problem that would cause LinkMachine not to find reciprocal links if they didn't exactly match the site's URL. Added category name HTML tags to the link page format options. Added option that allows you to be automatically notified by e-mail when a site is submitted. Added the option to have LinkMachine send the user a copy of all e-mails that it sends out. Click here to try out LinkMachine for free right now, with no risk! LinkMachine © 2004-2011 IronZog. All Rights Reserved. We welcome your questions and comments! Click here to contact IronZog.